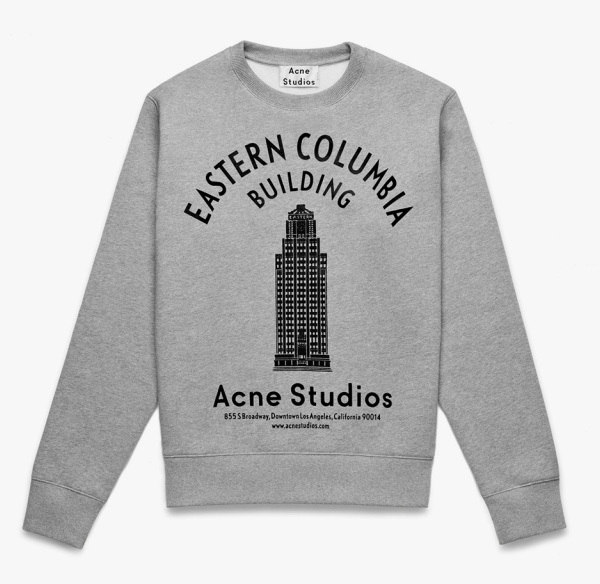 Sweden’s Acne Studios marks their one-year Los Angeles residence with this Casey crew neck sweatshirt. The Casey features an illustration of the famed Eastern Columbia Building which Acne calls home, a stunning LA landmark that is the work of famed architect Claud Beelman. Beelman’s work can be seen throughout the downtown LA skyline, as his firm penned many of the other Streamline Moderne/ Art Deco masterpieces that flourished in the early part of the 20th Century. Pick one up a the sprawling 5,000 sq-ft store only.